By now we had established a routine. We both would stay overnight, Omar would awake in the morning, go pick up our older son Masieh, take him to school and then return to the hospital. In the afternoon, I would pick Masieh up from school, spend a couple of hours with him and then drop him at my mothers. Although this routine was very rough, it had become our “normal”. At only 6 years old, brave, big brother Masieh was handling it gracefully. I would occasionally allow him to visit his baby brother in the CICU, but it clearly wasn’t a healthy environment (mentally or emotionally) for him to be exposed to. Sometimes we would need a break, yearning to feel normal again, and striving to provide some stability for Masieh, so we would escape to the local arcade for an hour or two, where we would often bumped into other CICU parents. Although, it seemed as if this had been going on forever, it was only going on day 11, December 28th, 2009. Christmas had passed and the hospital was still stirring with holiday cheer. They had passed out gifts to all the children, and Samad received a little grey donkey that we named Jelly…lol… I was also blessed to have a one of my spiritual sisters, Valeria Muhammad, R.N., come up to CHOP, where she would remove the staples from my belly, due to my c-section as I stretched out on the bed in our little sleep room. Now, this may seem a bit drastic but at this point I made it my bond that I would not be leaving CHOP until I had Samad in my arms; so drastic times called for drastic measures and Sis. Lee was just the person that I needed. Now I could finally began my healing process, or at least the physical aspect of it. Samad seemed to be fairing pretty well, but had not showed much improvement. This particular day things had started going downhill. Samad’s leg had become very swollen and red, almost 3 times the normal size. He had developed blood clots and his leg had very little functioning. His body was swollen all over and it became very hard for him to move. He was still being fed through a tube and still on around the clock meds. This was an indicator that his body was not accepting the foreign device (pacing wires). With blood clots, fluid on his heart, blood pressure and heart rate, dangerously low once again, doctors had to make a decision and quickly. What would happen next, many of his doctors had never experienced throughout their careers. 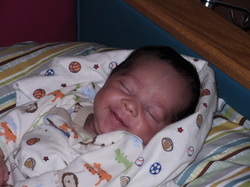 The next morning, December 29th, 2009, at 12days old Samad would have open heart surgery #2, to have a permanent pacemaker placed. The device was the size of a silver dollar. It would be placed in his belly, below the rib cage, carefully situated in a pocket between the muscle and skin. This surgery was much longer than the first because of its complexity and would take close to 5 hours from beginning to end. At first glance, Samad was unrecognizable. That fat, full faced baby we had last seen, was now very skinny, just under 4 pounds, very fragile. He had a breathing tube down his nose, now medications were being sent through a line in his leg and his appearance was obstructed by the dozens of wires, tubes, stitches, etc…. Within 2 days, Samad was ALIVE again! Over the next couple days we would hear him cry for the first time in 2 weeks. We would change his diaper and he would open his eyes and recognize us and finally, Allah bestowed his mercy on us, we were able to feed and hold him in our arms. We would sit day and night by his bedside and read the Quran to him. When family and friends came to visit they would take turns reading the Quran & Bible, especially Sis Laurie & Grandmom Arlene. And you know what, he got better. Soon we were moved out of the CICU, although bittersweet because we had developed so many relationships with the nursing staff, but on to the CCU (normal cardiac floor) where we would meet new, lifelong friends, like Crystal Dailey & Jordyn Elyse. New Years came around, Masieh, Omar and I spent it at the hospital, we were happy to be together no matter what. We even had a surprise baby shower that was put together by our spiritual family of Muhammad Mosque #12. Omar was in on the surprise and convinced me to pull myself away from the hospital, get all dressed up because he was "receiving an award". Well he never received that award, but the gift we got that evening was much better. The gift of love, sincerity and support. Samad was getting stronger everyday and it seemed as if the worst was behind us and for the most part it was. We knew that the road ahead of us would be long but the battle we had won was remarkable. Samad would finally meet Grandmom Darlene, Pop-Pop James and Auntie Kamelah. During the winters 3rd storm they would fly in from Chicago and Atlanta. They had been sending long distance love and prayers, for a whole month so it was a comfort to us when they arrived. February 9th, 2010 was discharge day. Through a dozen or more cardiac arrests, 2 open heart surgeries, laugh, cries, hospital photo shoots, 4 room changes and a host of memories we had survived. Samad was a healthy 6 pounds, eating on his own and beautiful! I was able to nurse him and hold him as much as I wanted to now. Masieh was starting to get the hang of being a big brother and Omar was working on mastering the art of fatherhood. Discharge would come with more obstacles but none that we couldn’t overcome. CPR training, medications, a defibrillator and apnea monitor would all have to go home with us. With all our tears in tow, 59 days coming to an end, we packed our belongings up and prepared to began our new lives as a family of four…. Over the next year and half, Samad would see a cardiologist once a month, be hospitalized a dozen more times and experience 3 really close calls. Samad will have to undergo another surgery in another year or two, to have his pacemaker replaced, because at some point his device now will not be able to support his growing body. But Samad is a fighter so we are not worried. Not only did this change our lives as parents but this experience would also change our lives as a married couple. Omar and I would eventually discover through genetic testing that we both infact carry a gene for Prolonged QT Syndrome. Our two genes combined had resulted in the severity of Samad's disease. I would also learn that my older son Masieh carried my gene as well. Masieh and I take medication daily and although Omar should be, he has decided to stick to his "raw milk" remedy. Even though the three of us have never experienced any cardiac issues, we've learned that you can go your whole life without any symptons and still have a fatal cardiac episode with little to no warning. So we're taking the proper precautions so that doesn't happen. Our dreams of having a large family of 6 children have come to a screaching hault for now. We don't know what the future holds for us, maybe adoption or another try at conceiving naturally with hopes of a different outcome. However for now, we love our boys and we couldn't ask for anything more! Three babies that we came to know on the 6th floor of CHOP have now passed away to a better place, where Allah has taken away their pain. We still pray for those families everyday and hope that Allah continues to lighten their hearts of the grief that they are still feeling. Not a day goes by that we don't PRAISE and THANK ALLAH for breathing life into the body of Samad. We can only pray that we have the strength to take care of this special child because we are so blessed to be his parents. I wish I could say that this story was made up. That perhaps it is a figment of my imagination. Or that maybe even parts of it are a little exaggerated. But if I said that, I would be lying. It's all true from beginning to end. Many of you who read this will say, "I didn't think it was that serious"; maybe for some of you this is your first time hearing about Samad and for others like our close family & friends, you will wish you could have done more to help. Either way, don't feel sorry for us, we have spent enough time, walking around feeling sorry for ourselves. We can only hope that you take a piece of our story, reflect, learn something and then pay it forward. That is our goal, to use Samad's Story to advocate & educate. So we reflect on the past, but we live for today by continuing to move forward.